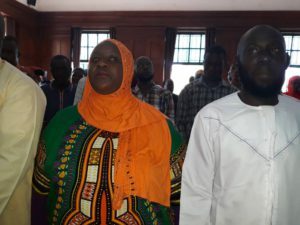 The High Court in Kampala has today heard that seven of the 19 muslim suspects facing trial over treason are in sane mental status, with no physical injuries. The testimonies of Police Health Service director Moses Byaruhanga and Dennis Asiku, a clinical officer from Mayfair Clinic in Najjanakumbi, as documented in reports have been accepted as prosecution exhibits in court presided over by Justice Wilson Masalu Musene . This brings to 10 the number of prosecution exhibits in this case, whose trial kicked off yesterday morning. The examined suspects were; private Rajab Mubajje, Isa Matanda, Hajji Abdul Byamukama, Asadu Ssemwogerere, Solomon Kibirige , Safia Wadwani and Nick Frank Abonga. Yesterday the same court also heard evidence from Dr Emmanuel Nuwamanya and accepted as exhibits the mental status reports he made in respect to Yusuf Ssentamu, Muhammad Kalodo and Ismeal Ssentongo . All the 19 suspects, including a woman Aisha Nakasibante, who is also an in-law to Austrian-based cardiologist Dr Aggrey Kiyingi, are facing two counts of treason and concealment of treason. These are said to have plotted to over throw the government of Uganda by use of firearms between 2013 and 2015 at various places in Uganda, Dubai, Kenya and Tanzania. The suspects are further said to have expressed this plot through utterances, recruitment and training of rebels, acquiring satellite mobile phones for communication, motorcycles and vehicles for transport and also rented houses to act as safe houses to accomplish their mission.